Mezzanines can add 40%-50% more storage space to your existing building. Expect to pay $14-$15 per sq. ft. for a large mezzanine, and up to $20 for a smaller one. Production and material delivery can take 8-10 weeks after drawings are approved. Installation can take 1-2 days and up to 3 weeks for larger projects. Free Consultation. We’ll meet with you to discuss your needs and to conduct an on-site evaluation. Free Estimate. After the consultation, we’ll create an estimate for your project at no charge. Revise/Approve Drawings. The mezzanine plans must be reviewed and approved by an engineer. Most states require a permit too (we can help with this). The engineer’s stamped drawings can cost anywhere from $1500-$2500. Production and Delivery. Usually takes 8-10 weeks after the drawings are approved. Installation. Smaller projects can take 1-2 days, while larger projects can take up to 3 weeks. We’ll make sure that your mezzanine adheres to applicable building codes, industry standards, local seismic requirements, and your exact specifications. Prior to installation, we will inspect and evaluate your facility’s structure, slab, and soil, to ensure it can withstand the additional forces. Our designs are certified and stamped by a structural engineer. 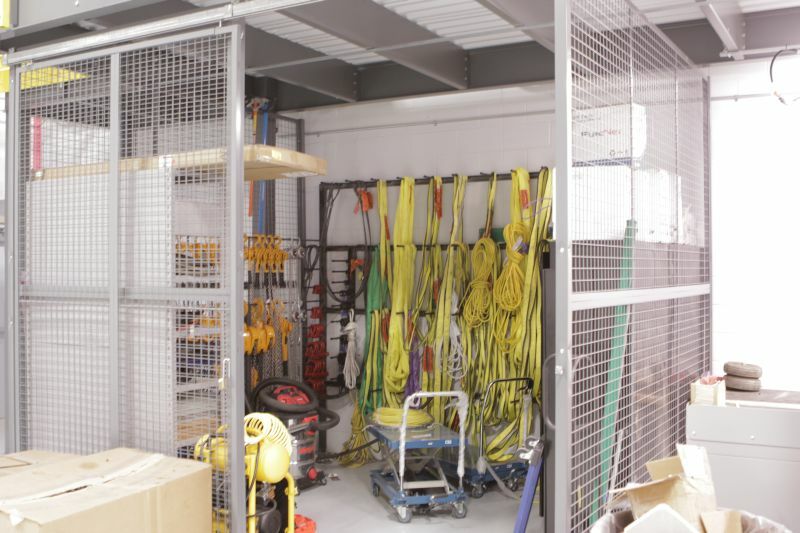 After the installation, we’ll thoroughly inspect the mezzanine for safety and durability. A large mezzanine can cost $14-$15 per sq. ft., and up to $20 for smaller projects. Mezzanines built over existing shelving cost less because we’ll use existing structure for support. We interviewed Mark Lancaster and Paul Hanson from ODEC about working with us on their mezzanine project. The client didn’t have space for a tool room and wanted a mezzanine to use for tool storage. This sliding gate on the second level locks to secure tools and equipment. Lower storage area to store regularly-used items. 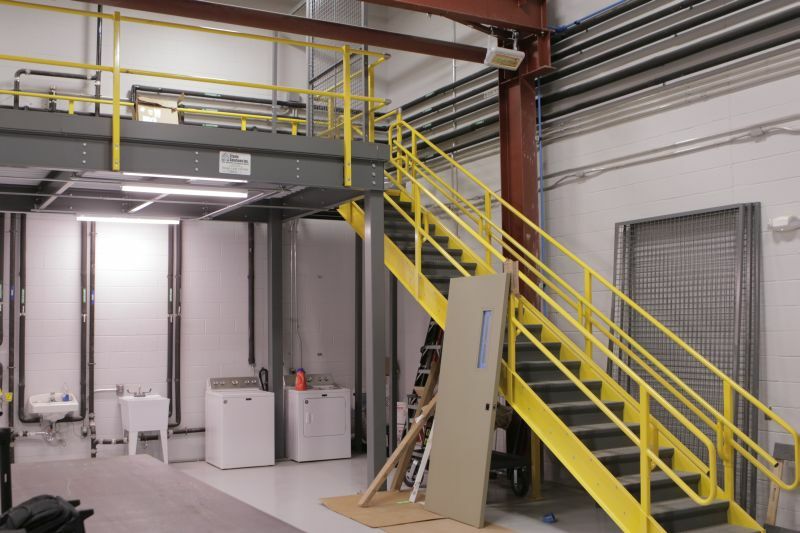 We’ll help you utilize the unused vertical space in your facility by designing and installing a custom mezzanine system. If your facility has a ceiling greater than 14 feet high, you might be a perfect candidate for a mezzanine system. 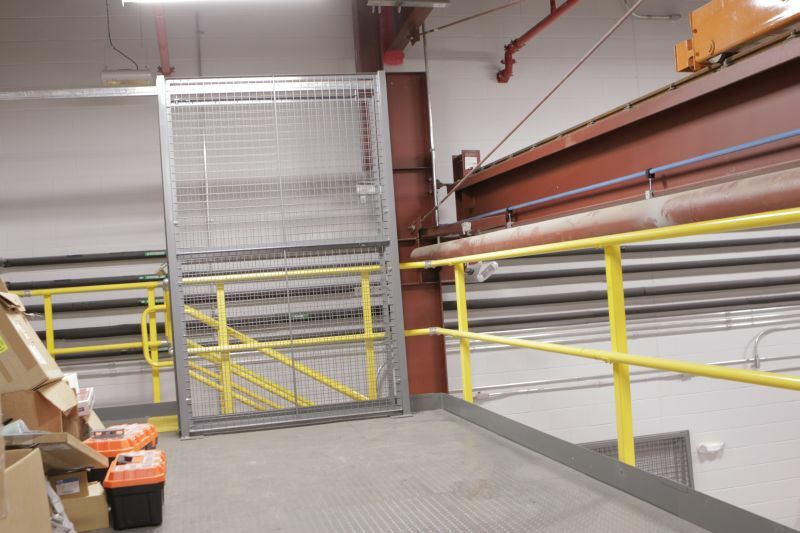 Installed above your existing machinery, storage, or racks, this system will give you an additional level where you can add offices, equipment, conveyers, or storage. With a mezzanine system, you can add 40% to 50% more usable space, at a fraction of the cost of expanding or relocating. Partner with J&J Material Handling and gain this flexible space at a fraction of the cost of new construction and without the hassle of moving to a new location. Before we design and install a mezzanine system, our team will determine your facility’s needs and capabilities in supporting the system. We will meet with you, learning more about your operation and your desires and needs. Our engineer will evaluate your current setup, along with the thickness and quality of the concrete slab floor. We will also discuss potential placement of columns, supports, and shelving, so we can minimize the modifications to your current arrangement. When designing your mezzanine solution, we can use several decking solutions to meet your budget and your planned usage. We’d love to meet with you to discuss what you’re looking for and how we can help.